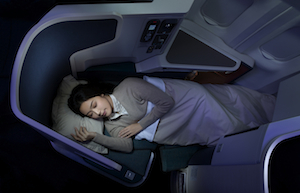 2011 saw Cathay Pacific flip the traditional herringbone business-class format on its head to redress passenger concerns regarding seat width and privacy. Set at a relatively close pitch, Head Impact Criteria testing is the main certification hurdle to be cleared by reverse or ‘traditional’ herringbone schemes. The addition of an airbag to the seat belt provides a satisfactory solution in this respect. Frequent flyer forums and message boards confirm Park’s observations. 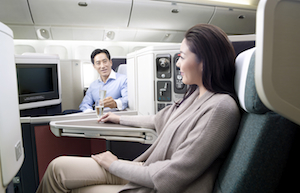 Some of Cathay’s customers never really took to its previous product, feeling too hemmed in by the high sidewalls, while seat width and privacy concerns are also mentioned in some posts. 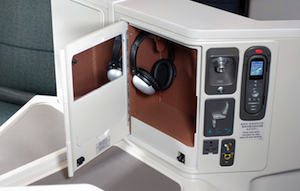 McGowan is understandably defensive of such criticism: “We designed our new product to be the best long-haul business class in the world, not to be better than our current business class,” he says. 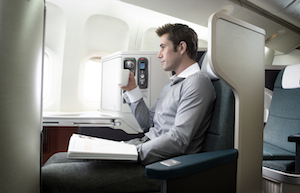 A large table that can be used in conjunction with a side cocktail table makes for a better all round working environment, while McGowan says broadband internet will be introduced across both Cathay Pacific and Dragonair’s fleets from 2012, courtesy of Panasonic’s eXConnect system. 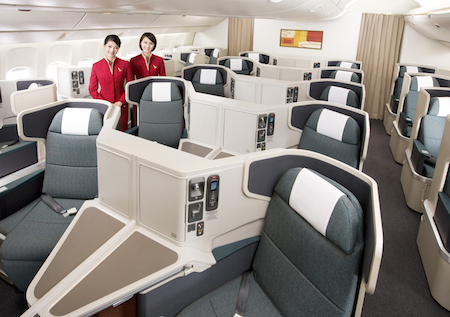 From 2011, the new seats have been line fitted to all of Cathay’s new deliveries in Seattle and Toulouse. Meanwhile retrofits are handled by TAECO in Xiamen, Southern China. “We have an aggressive schedule and by the first quarter of 2013 all of our long-haul A330 and B777 aircraft will be equipped with the new product,” stated McGowan at the launch. Surprisingly, the airline is not fitting it across its whole long-haul fleet: “Our passengers really value the comfort of the existing business-class bed, as well as the privacy it provides; hence it will remain fitted to our A340 and B747 aircraft,” explains McGowan.